God is in the details. This old mantra stands especially true for model railroading, which is largely dependent upon the amount of effort and patience you are willing to show a layout. If you take the time to add small details that give touches of realism to your scenes, those scenes are going to come to life and grab and hold a viewer’s attention. With that in mind, we spend some time in this lesson teaching you how to take your new scene to the next level, paying close attention to the details and adding simple model railroad stuff that will make layouts truly pop! To help you raise the reality of your layouts up a notch, modeler and artist Tom Lund demonstrates a variety of expert techniques and introduces model railroad stuff that you can utilize to grab a viewer’s focus and keep their eyes moving throughout your scene. He talks about several components of the scene, using model railroad stuff he typically opts for in his own scenes, from interior lighting and signs to street detailing and mini scenes. 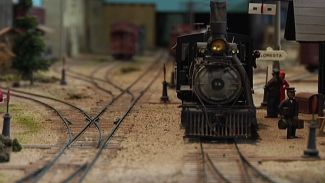 First, Tom shows you how to take a portion of a street scene and add model railroad stuff that amplifies its reality. You’ll learn the best way to use styrene, tape, steel wool and various colors of spray paint to designate asphalt from sidewalk and sidewalk from driveway. Tom has done this process many many times, so he breezes through it, but he uses simple techniques and basic model railroad stuff that modelers of any skill level should be able to replicate with ease. Next, Tom zooms in on the buildings and street corners to walk you through the proper techniques for interior and exterior lighting, window and wall decorating and mini-scene creation. Your main goal with adding model railroad stuff such as traffic jams and bus stop conversations is to always seek realism. Make sure your vehicles are to scale with figurines and all signs are historically accurate and correctly weathered depending on location. 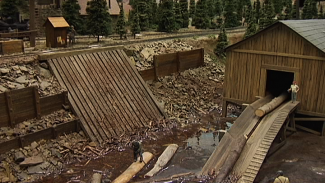 Your other goal is to just have fun with it–see what model railroad stuff you can include in your scenes to make them as realistic as possible! What thickness styrene does Tom find works best for the floor dividers? Hi, Kevin. I’m not sure what Tom does, but basically depending on your scale, the size of the building, and the structural support below, I feel it’s best to over-engineer your project for strength and to minimize warping.